At home haircuts are an easy way to save money in your family’s budget. You just need to be willing to learn a new skill and invest a small amount of money. For a family of 7, haircuts are a place in the budget that can add up to big bucks if I’m not careful. Fortunately, I’ve come up with a few strategies to keep the cost of haircuts manageable. My husband gave me a pair of hair cutting scissors, a comb, and a Wahl clipper about 9 years ago for Christmas. I think the scissors were under $20 and included the comb, and the Wahl clipper set ran about $50. That set lasted for about 5 years. I bought a new set at Target for just under $50 which included a small clipper for cleaning up the neck and ears. If I took my 4 boys to a budget salon ($7/child), I would spend about $242.66 per year. Until my daughter decided to cut her hair herself, we spent no money on cutting her hair. If you add in the cost of my husband’s haircut ($13) – $112.58/year, the total cost for my husband and kids is $355.24 yearly. 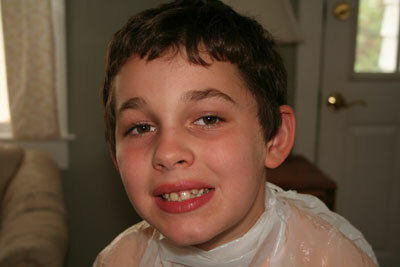 The scissors, comb and clipper have saved us a lot of money over the years! Cutting boys hair is pretty simple. Watch a hairdresser first to see how they treat the different sections of the head. Generally, the sides are shorter and cut vertically while the top is slightly longer and cut parallel to the ears. 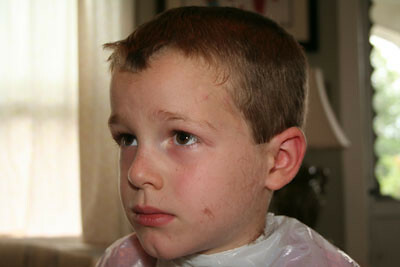 There is an invisible line around the head about an inch or so above the ear where the direction of cutting is switched, and the length of the hair increases. As you practice, start with the sides and leave them longer about an inch above the ear until you get a feel for where the transition point is. It’s always easier to cut off hair than to add hair back in. For the younger boys, I start out with the #4 on the clipper and do the sides. The #4 does a good enough job on the edges of the hair that I don’t have much to clean up at the end of the hair cut. I always scissor the top, cutting parallel to the ears, front to back. Remember, to move around the head and never reach too far. I use #3 for the older boys. When doing the side burns, I cut the hair across just below where the ear connects to the head. For my husband, I cut a little longer since he likes his side burns a little longer. The small clipper helps with cleaning up the stray hairs. When trimming around the edges, I comb the hair down and cut across. I do the same around the ears. Be especially careful around the ears since it is very easy to nick the skin, and little kids never forget the time you cut their ear. Never. Finally, I use the small clipper to clean up the neck area. I do a short straight line across the back of the neck. To keep the kids from wiggling too much during the hair cut, I let them watch tv. I do have to remind my kids to sit up straight. I never use a chair for hair cuts since I find the back of the chair gets in the way. I have an Ikea stool that works perfectly. Under the stool I lay an old tablecloth to collect the hair. For a cape, I have a plastic one that came with the clippers. It no longer ties so I use a clothespin to keep it closed at the back.